JWM is a light-weight window manager for the X11 Window System. JWM is written in C and uses only Xlib at a minimum. Because of its small footprint, JWM makes a good window manager for older computers and less powerful systems, such as the Raspberry Pi, though it is perfectly capable of running on modern systems. JWM is included in small Linux distributions such as Puppy Linux and Damn Small Linux, and it is available as a separate package in many other distributions. 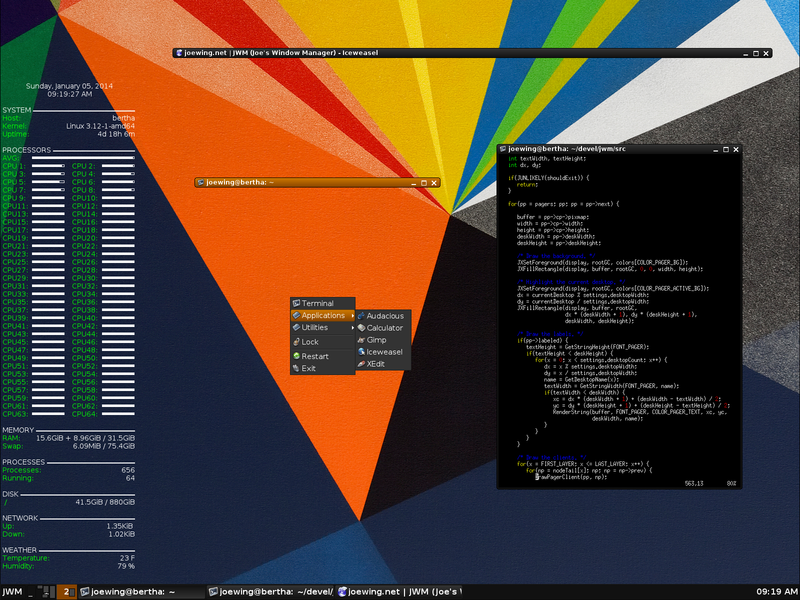 The obligatory screenshot: JWM v2.2. JWM attempts to conform to the ICCCM and supports both MWM hints and Extended Window Manager Hints (EWMH). As of version 2.3.6, JWM is licensed under the MIT license. See GitHub for recent updates. See the JWM setup guide for instructions on setting up JWM. See the configuration documentation for comprehensive documentation on configuring JWM. JWM also comes with a manual page (run "man jwm" on the command line after installing JWM). JWM is hosted on GitHub. Please feel free to contribute bug reports, suggestions, and patches. Feel free to file bug reports on and request support on GitHub or email me directly at joewing@joewing.net. Note that JWM at SourceForge.net is no longer active.